Hospitality is an industry that pushes a country to promote itself on a global level – based on the services offered nationwide there can be an influx of people willing to try something ‘new’. Then there are hotels that cater to certain groups or companies. The clientele consists of corporate representatives needing a luxurious place to stay for the night. The size of the establishment can vary – in this case it’s a two story building on MM Alam Road, Lahore. The rooms had to be sumptuous and the lobby even more so. 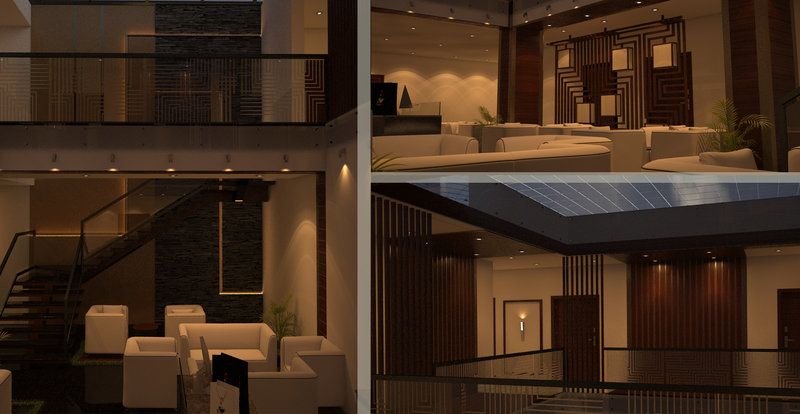 The walkway above the double height lobby had to be effectively screened by a best interior designer in Pakistan, so tenants wouldn’t be visible to the guests below. The lobby feature areas included a backlit stone wall as well as a decorative screen housing Asian lamps. The theme of the hotel emerged from the floor pattern – a series of wooden rectangles bordered by grass, embedded into black granite. The geometry of the column beam structure allowed for ‘rings of wood’ to be created which framed certain areas of the space and made for cozy seating. People are more likely to associate the word corporate with mahogany furniture and black suits. When it comes to Opium, I suppose it’s more about exclusivity. The hotel won’t cater to just anyone – but I suppose that’s also on a need to know basis. Also located on site is the Thai restaurant by the same name. That does cater to everybody – at least those who have an affinity for Thai food with nice allocation of interior by a good architect in Lahore. The interesting thing about this project was that the design of everything was entirely dependent on the furniture layout. The electrical diagrams, the false ceilings and the sanitation drawings could not be complete without knowing which wall the bed was facing and where the TV would be. And when the client wanted to change something they would consider rather small – say the kitchenette – a whole set of drawings had to be revised. This was a far cry from residential projects, where changes in furniture arrangement mostly require amendment to a window size or two. Now with the design process complete, it will be interesting to see how the hotel turns out. The owners are in quite a hurry to start service – with the summer season fast approaching that might just be a good thing!